Stephenson was well aware of the dangers faced daily by coal miners. He had seen at first hand the horrific consequences of underground explosions — blasts occurred at Killingworth Colliery in 1806 (causing ten deaths), and again in 1809 (12 fatalities). He would risk his life in 1814 to help seal off a deep tunnel where the workings were on fire. The culprit was thought to be the flammable gas known as firedamp, which seeps from seams of coal and is mostly composed of methane. It was being ignited by the candles and oil lamps used by the miners. For lighting in pits suspected to contain firedamp, the only other available option was to use a 'steel mill' — a steel wheel manually rotated against a flint to produce a shower of sparks — which required an extra person in the mine to operate it. Steel mills did prevent some explosions and were safer than candles or oil lamps, though the fitful light they produced can't have made mining any easier. In the early 18th century in northern England, as more and more mines were opened up and coal extracted from greater depths, more firedamp was liberated and the number of explosions increased. Coal dust can also explode but its combustibility was not recognised at the time. The years 1812-3 were calamitous for the Newcastle mines. On 25th May 1812, an explosion at Felling Colliery, Gateshead, resulted in the deaths of 92 men and boys. On 10th October, 24 miners were killed in an explosion at Mill Pit, Herrington. Then a second blast at Felling Colliery, on 24th December 1813, caused 22 more fatalities. In 1812 while Stephenson was installing stationary haulage engines at West Moor Colliery, disaster struck a nearby mine. A safer method of illumination was definitely needed. Dr William Reid Clanny (1776-1850), a physician and resident of Bishopswearmouth near Sunderland, had seen the injuries inflicted by such explosions. He devised a safety lamp in which a candle was isolated between two containers of water. Air was pumped to the flame by bellows. He apparently tested the prototype in 1812-3, and his paper On the Means of procuring a steady Light in Coal Mines without the danger of Explosion was presented at the Royal Society (est. 1660) on 20th May 1813. On 1st October that year, the Society for Preventing Accidents in Coal Mines was instituted. Later known as the Sunderland Society for Preventing Accidents in Coal Mines, its founder members included mining magnate Sir Thomas Liddell (1775-1855), Rev. John Hodgson (1779-1845), mining engineer John Buddle (1773-1843) and Dr Clanny. In 1814, the Monthly Review commented on the lamp: "... we think it ought to be tried in all mines that are exposed to the terrible accidents which of late have so frequently occurred" (Vol.74, May-August). Though innovative, it was unwieldy and required someone to operate the bellows continuously. It also tended to go out when gas was present. Stephenson conducted his own (hazardous) experiments in 1815. He held lighted candles to a jet of firedamp hissing from a fissure in Pit A at Killingworth, and found that the gas burned at the base of the flame, not its tip. He concluded it would not ignite if the velocity of the jet was fast enough. He also noted that the "gas will not explode through small apertures". If a lamp's flame could not pass through a very small hole, it could not ignite the surrounding gas in the atmosphere of a mine. He discussed his ideas with his friend Nicholas Wood (1795-1865), by now manager at Killingworth. Together they tested homemade versions of Stephenson's lamp and, in July or August 1815, Wood made working drawings for its manufacture. A prototype was ordered in late September or early October, and the finished lamp trialled at Killingworth on 21st October. Air was fed to the wick through a tube in the base of the oil chamber and the flame was enclosed in a glass sleeve. The whole apparatus was protected by a metal casing, pierced by little holes at the top. After some design refinements, including an increase in air flow to the flame, the lamp was retested in Killingworth's Pit A on 4th November. It was more reliable than the prototype but Stephenson thought it could be better. He commissioned a new model on 20th November 1815, coincidentally the day the Napoleonic wars officially ended. A few days later, he showed the second lamp to the owners of Felling Colliery. Stephenson's third safety lamp performed well at Killingworth on 30th November, enabling him to enter and leave gaseous parts of the workings in safety. More lamps were ordered for use in the mine. On 5th December, he and Wood gave a working demonstration of the latest model to the Newcastle Literary & Philosophical Society, using pigs' bladders filled with firedamp to test the light. Dr Clanny exhibited his bellows lamp at the same meeting. Despite the success of Stephenson's lamp in the Newcastle area, controversy was brewing. Almost concurrently, celebrated scientist Sir Humphry Davy (1778-1829) of the Royal Institution (founded 1799) was also designing a miners' safety lamp. This led to a long-running dispute over which lamp came first. Davy had been retained by the Sunderland Society to "interest himself in the cause" and the Rev. Hodgson's subsequent correspondence with the Newcastle Courant, along with assorted letters in other newspapers, gives us a timeline of his activities. In August 1815, Davy visited Buddle's Wallsend Colliery and others in the Newcastle area. He returned to London at the end of September and was sent samples of firedamp from various mines. He investigated five lamp variations, one of which was soon discounted. By 19th October, he too had discovered that the flame of ignited firedamp could not pass through a small tube. On the 30th, he described a lamp with tubes above and below the flame. On 9th November, Davy's paper On the fire-damp of coal mines, and on methods of lighting the mines so as to prevent its explosion, with details of his tube lamp, was read before the Royal Society (pub. January 1816 in the Transactions). 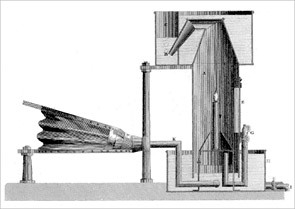 The paper praised Clanny for his "ingenious apparatus" (the 1813 lamp), though Davy believed it had "not yet been used in any of the collieries". Stephenson's name was not mentioned. On 18th December, The Morning Chronicle announced Davy's application of wire gauze to his safety lamp. In his paper published in The Philosophical Magazine & Journal (July-December 1815), Davy noted that "Explosions likewise I found would not pass through very fine wire sieves or wire gauze". He describes a lamp that admits air "through apertures covered with brass wire gauze" containing holes not more than 0.2mm across. The base of the flame was also surrounded with a series of concentric cylinders of gauze, which he called "flame sieves". The same journal followed Davy's paper with publication of an unsigned letter dated 10th December 1815, entitled On safe-lamps for coal mines; with a description of the one invented by Mr. Stephenson, of Killingworth Colliery. According to Davy's biographer, physician John Ayrton Paris (1785-1856), Clanny — also in 1815 — had invented a "steam safety lamp" in which the inlet air was mixed with steam before it could reach the flame. The lamp had "the valuable property of remaining cool" and was apparently in use at Herrington Colliery, Sunderland. Though Davy and Clanny had met, it seems clear that Davy and Stephenson worked independently and only became aware of each other's inventions after the fact. The controversy was more about timing than design details, as the lamps were different. Their relative merits have been argued over by a succession of authors ever since. By this time, Stephenson's son Robert Stephenson (1803-59) was 12 years' old and had moved from the village school to John Bruce's (1775-1834) private academy in Percy Street, Newcastle (founded 1802). Bruce's teaching was designed to prepare boys for trade and business. Lessons included French, mathematics and geography. Robert attended 1815-19, for a fee of £10 per year. As the school was some 8km from West Moor, Stephenson purchased a donkey so Robert could get there, though he was expected to continue his studies at home in the evenings. 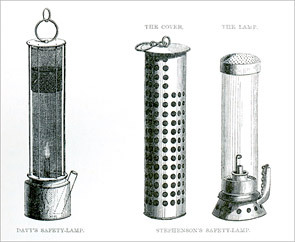 By January 1816, Stephenson's perforated plate lamps were in production and on general sale in Newcastle. At the same time, Davy's prototype with its wire gauze chimney was being tested successfully at Hebburn Colliery. The heat-absorbing gauze prevented the flame from making the firedamp hot enough to explode, and the lamp was soon in manufacture. However, in highly gaseous atmospheres, the tops of Davy's lamps became red hot, while Stephenson's lamps went out. In wet conditions, Davy's lamps tended to rust and became unsafe. 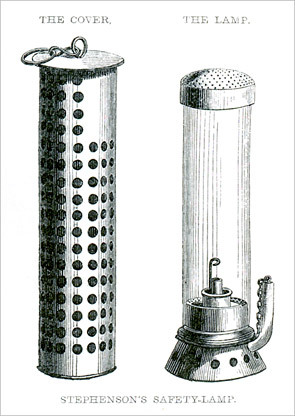 They both had their good points, and later production models of the Stephenson lamp featured a wire gauze screen in place of the perforated metal casing around the glass chimney, while the Davy lamp incorporated a glass cylinder. Davy was awarded £2,000 for his lamp, as well as the Royal Society's Rumford gold and silver medals for his papers published in the Transactions. The Rumford Medal is awarded biennially for outstanding research into the physics of materials. And what of Clanny? Well, the Royal Society of Arts (founded 1754) awarded him a silver medal for his lamps on 31st May 1816, and a gold medal for his steam safety lamp in 1817. In 1821, he donated the original 1813 lamp to the Literary & Philosophical Society. Stephenson's achievements were not acknowledged at the time. When Davy was credited with the invention of the miner's safety lamp, Stephenson sought to set the record straight, stirring ill feeling among Davy's supporters. In his defence he responded calmly, "... I have been actuated solely by a justifiable attention to my own reputation, and a sincere desire to have the truth investigated, and not by any disgraceful feeling of envy at the rewards and honours which have been bestowed upon a gentleman who has directed his talents to the same object, and whose reputation is too well established to be injured by me, even if I had the baseness to attempt it". On 1st November 1817, at a meeting in the Newcastle Assembly Rooms, it was resolved that Stephenson, "having first discovered the fact that Explosion of Hydrogen Gas will not pass through Tubes and Apertures of small dimensions, and having been the first to apply that principle in the construction of a Safety Lamp, is entitled to a Public Reward", and that a subscription be set up for the purpose. The 14-man committee appointed to carry out the resolution included John Bowes (1769-1820, 10th Earl of Strathmore and Kinghorne), industrialist William Losh (1770-1861) and the Brandling brothers of Felling Colliery. The sum of £1,000 was collected, and on 12th January 1818 at a gala dinner in the Assembly Rooms, Stephenson was presented with a silver tankard and the balance of the money. The miners of Killingworth and neighbouring collieries were unswerving in their preference for Stephenson's lamp — by now known as a 'Geordy' or 'Geordie' Lamp. Robert Summerside, overman and manager of the pit in which Stephenson had conducted his experiments, claimed that using the lamp had prevented further explosions. 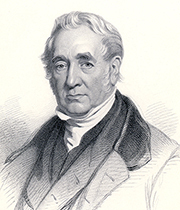 As Rolt wrote, "There can be no more satisfying reward for an inventor than the saving of human life and suffering upon such a scale as this, and if the name of George Stephenson had never become associated with railways it would have deserved immortality for this achievement alone". Miner's lamp designed by Dr William Reid Clanny (1776-1850). The candle is isolated between two containers of water and air pumped in by bellows. The prototype was tested in 1812-3. Stephenson's Safety Lamp, or the 'Geordie' lamp, as it became known. Comparison of Stephenson's lamp with the one designed by Sir Humphry Davy (1778-1829) (on the left), which used wire gauze. 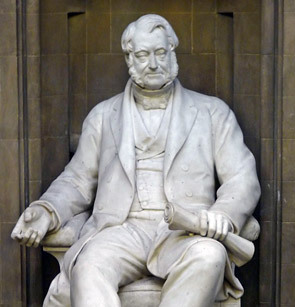 Stephenson's friend Nicholas Wood FRS (1795-1865), who became a mining and steam locomotive engineer in his own right — later founding President of the North of England Institute of Mining & Mechanical Engineers, where this statue can be found. Silver tankard presented to Stephenson in recognition of his achievements in producing the safety lamp. 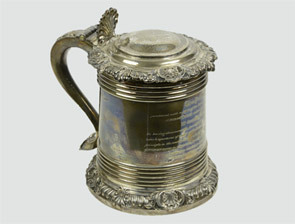 The tankard now belongs to the Institution of Mechanical Engineers — in 1847 Stephenson would become its first president. Inscription: "This piece of plate purchased with a part of the sum of 1000 pounds; a subscription raised for the remuneration of Mr George Stephenson, for having discovered the fact that inflamed fire-damp will not pass thro tubes and apertures of small dimensions & having been the first to apply that principle to the construction of a safety lamp, calculated for the preservation of human life, in situations formerly of the greatest danger, was presented to him at a general meeting of the subscribers. Charles John Brandling Esqr. in the Chair. Jan 12th 1818".